Free Shipping Included! 4-Slice Toaster, TOBOX Stainless Steel Toaster 4 Wide Slots with 7 Bread Browning Settings, REHEAT/DEFROST/CANCEL Function, 1400W, Rose Gold by TOBOX at Mint MD. MPN: TB-ST010. Hurry! Limited time offer. Offer valid only while supplies last. Simple & Efficient 4-Slice Toaster You Deserve It! Wide 4 Slots 1.4'' Wide enough with Self-centering Guides, allows you toast anything you like. Simple & Efficient 4-Slice Toaster You Deserve It! 1.4" Wide enough with Self-centering Guides, allows you toast anything you like. Easy to Push Down, safely in reach to remove smaller bread bagels waffles. Toast bread/bagels on both sides, without over-browning or burning it. 2 People, 2 Separate bread types, 2 Different browning settings, can enjoy delicous at the same time. A professional brand manufacturer with rich experience in kitchen items, focus on the product itself is all in. Two Years Warranty, 100% Money Back Guarantee or A New Replacement. KitchenMaid always stand behind our customer. ☞ 4 Slots More EFFICIENT than 2 Slots- Dual Independent Toasting Controls, less time spent, allows you to toast different tastes you love. ☞ AUTOMATIC Evenly Fast Toasting - 1400W High Power. For Light, setting 1(81s) & setting 2(123s). For Golden, setting 3(144s) & setting 4(174s). For Dark, setting 5 (203s) & setting6 (243s). NORMAL Bread Toasting Time for Reference Only. ☞ Extra WIDE Toasting SLOTs - 1.4" Slot Wide enough for thick bread bagels, Safely Easy Reach High Lift Lever, 7 Browning Control to accommodate your taste, 3 Basic Functions with CANCEL REHEAT DEFROST. 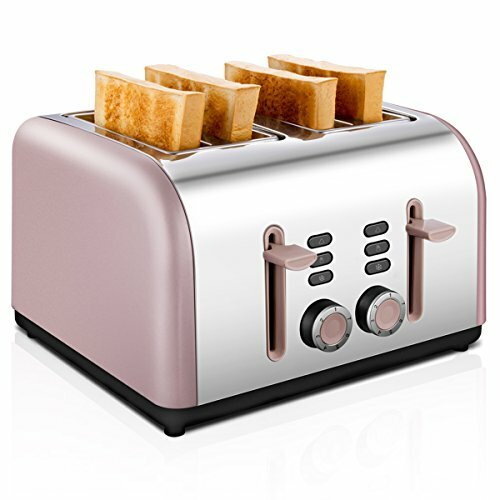 BASIC Toasting Features just You Needed, extremely meet all your daily toast needs. ☞ TWO Removeble Crumb TRAY - One Touch Button with blue LED indicators, Automatic POP UP, Easy Clean Separate 2 Trays, No-mess Cord Storage in Base. Simple 4 slice toaster, Twice as Fast speed, the whole family breakfast just gets easier now. ☞ More Safe & Durable - 18/8 Food-grade Stainless Steel Toaster, FDA Approved, durable for daily use. Relatively Quickly Cool to the Touch Exterior, free from your worry about burning fingers or fire hazard. If you have any questions about this product by TOBOX, contact us by completing and submitting the form below. If you are looking for a specif part number, please include it with your message.